please check out my studio's very first kickstarter campaign for an anthology book that we're putting together called The Blueprint 2! 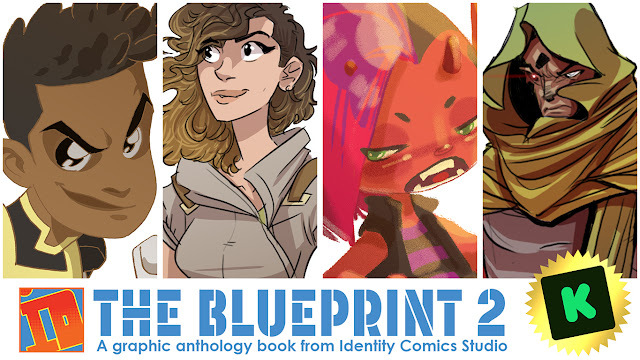 (https://www.kickstarter.com/projects/822502594/the-blueprint-2) we've got 4 short stories in there and lots of vis dev artwork. 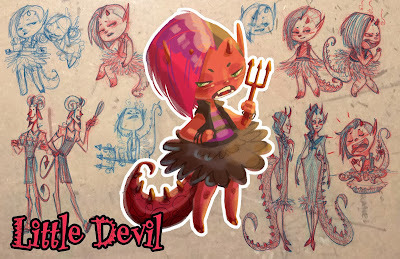 my story is called LITTLE DEVIL and it's co-created and written by my talented writer friends Susan and Jeffrey Bridges. i'm going to turn it into a mini webcomic which will come out about 4-6 pgs a month. then at some point, probably in about a year, i'm planning on collecting them to make a graphic novel. so this will be its introduction to the world! we can't wait to get it into people's hands and we really wanna make it super amazing. if we manage to break the goal, i think we may even be able to turn it into a hardcover - but don't quote me on that just yet. lots of logistics involved in that, ya know. but that's the hope! we just want a great product that each of us would be proud to have at our table and if we can deliver that to our fans, that's all we can really hope for. so please please consider backing the project. we've got super neat rewards that go from digital wallpapers, to stickers and pins, and all the way up to one-on-one commissions! and make sure u tell ur friends about it too!